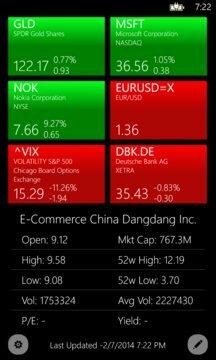 The iTrade app lets you track real time stock values for most markets along with their related news, charts - without endless page navigations. This app has a simple, sleek, fast, clean UI and fun to use. You can create live tiles for any stock item from your list. Just keep adding your favorite stock to the list and they are just a click away. All data gets stored on your device. 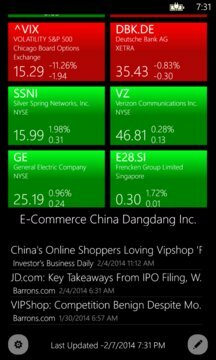 1) Add and Track stocks using watch List. Watch List can be toggled between two Views Modern UI and a List UI. 2) Analyze charts. Big Chart layout available in Landscape mode. 3) Read Financial news from various channels such as verge, Seeking Alpha, Yahoo, CNBC, Forbes, Engadget, Mootley Fool, USA Today and many more. 4) Pull down to refresh the stock values. 5) Auto refresh stock option. 6) Charts can be configured based on Regional language settings. 7) Live Tiles Option supported for any stock item. 8) Current values of various currencies supported. 9 ) Drag and drop to reorder stock items from the watch list. 10) Stock values formatting based on regional language settings. 11)Offline support for stock values. Will load the last accessed stock values in case of no data or data not accessible. 12)Option to sort the watch list based on stock symbols. -Added option to sort the watch list based on stock symbols under settings. -Added volume option to bigger charts. --Transparent tile support for the default main tile (not the live secondary tiles). -Offline support for stock values. Will load the last accessed stock values in case of no live data. -Added refresh menu button to reload news. -Bigger Fonts and improved UI loading. Note:- The currency rates are available for different markets. But at this point only current values are available. Feel free to email me any suggestions.